Rainbow Moon is a PSN original released for the PS3 in 2012. The Vita version is the same game, but has added cross-saves and some ease of use to the menus to create an on-the-go Rainbow Moon experience for those interested. Rainbow Moon will keep players busy for a long time – a trophy unlocks as players pass the 100 hour mark – with the main quest easily 50 hours. The main quest will have players exploring the world fairly in-depth due to the plot’s need for items in every corner of the world. Plenty of optional dungeons are available, and within both the story and optional dungeons players will see sealed off areas with containing enemies with levels in the triple digits. If you got a little thrill out of reading that line, then you understand what is in store for the post-game. It’s not just the dungeons: There are hundreds of little places where unmarked treasure is waiting to be found in addition to the visible treasure strewn about Rainbow Moon. And there are the systems the game contains – a simple crafting system where dropped items are placed onto weapons and armor to boost stats or give new abilities. All skills level up independently, and as the skills level up, damage increases and any status ailments available gain an increase in the to-hit percentage. The passive skill system has some wonderful skills available. Stats are increased using Rainbow Pearls gained with the finishing blow on creatures. Ideally, this lends to character customization, and the entire game uses a simple strategy RPG system with random battles – which characters must accept before entering – and onscreen enemies who will initiate battle when contact is made. The game is challenging as well. Moving the character in battle is permanent; there are no takebacks. Even enemies 15 levels below a player toward the end of the main story can really dole out some serious numerical hurt. While levels are typically displayed over the heads of on-screen enemies, there is no indication of what kind of enemies are in that group. This is in direct contrast to the random battles players can skip. Before accepting a random battle players are given an enemy breakdown. This breakdown appears random, as sometimes there are thirty-two enemies of one type and nothing else. Graphics are bright and beautiful, with tons of little animations in the background to make the world seem alive. Characters animate well despite the limited animation in the game. Still, Rainbow Moon literally looks as it sounds – a small planetoid lush and full of color. The music is very nice, and overall fits the lighthearted mood the world represents. On paper this game sounds idyllic. Rainbow Moon has a lot going for it, but for every good point the game offers an equally bad counterpoint. The worst offense involves the controls. SRPGs are primarily menu-driven games, and both the Vita and PS3 primarily use the analog stick. Doing so often causes; especially in battle, the cursor to jump around the available options. Navigating the battlefield is done with the analog and the game is presented in a three-quarters view which occasionally confuses the system about which way to go – an example would be attempting to go across and instead head down. It also happens quite a bit in shops. The control issue is a little weird, considering how well SideQuest Studios’s previous title Soldner-X: Himmelsturmer plays. Unfortunately, the plot is very bare bones. Players guide Baldren and his party through Rainbow Moon after he is pushed into a teleport circle by his rival Namoris. Upon landing in Rainbow Moon, the area is flooded with monsters. Baldren’s quest is to eventually gather up the pieces of a rod which will take him home and remove the monsters from the world. Not having much plot, the writers elected to make the characterization of the world’s inhabitants tongue-in-cheek. The end result is fairly terrible – the NPCs are annoying to deal with and come off as lazy or stupid. Alas, this is how players see the world since Baldren and company have no dialogue once they are made members of the party. That’s right – none of the characters have characterization once in Baldren’s employ. What’s left is the terrific amount of things to do in Rainbow Moon, a weight which must be carried by the battle system. Rainbow Moon is a grinding title, so the battle system should be good, correct? Well, it’s decent. The strategy part is a misnomer. Upon hearing the word strategy, grids and tactics may come to mind. Well, there are grids. Tactics involves item management, which is a tedious yet expandable process in the game. The expansions cost money, so players must grind for it. In fact, everything in Rainbow Moon has a grind behind it. This is not necessarily a bad thing, but players should be aware of it. Unless players use real money to buy fake money. There are times when tactics are needed, but during the main quest the player will most likely be spamming a character’s most leveled attack against enemies who are just simply too powerful or numerous. Despite having six people available to recruit, only three party members may participate in battle at any time. Often, it will be against five times as many enemies, most of which can kill a character in two hits – even if that character’s defense stats is maxed and has the best available armor equipped. 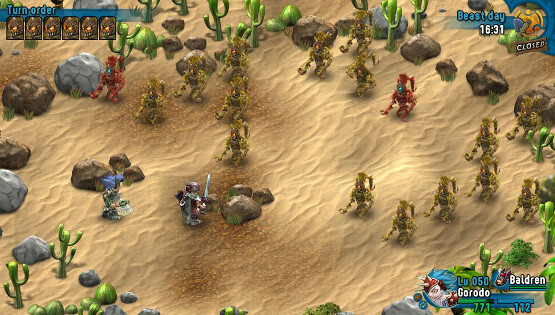 A shrewd player would use the drops from enemies to supplement the defense stat, but often it seems as if enemies are able to ignore defense. There is also little reason why only three players are available for combat, considering later fights often feature 30 or more enemies. Stats in Rainbow Moon also don’t appear to have a direct correlation with anything. The game is one big trial and error to see what works and what doesn’t in combat. This is apparently Retro. I disagree. This is Random. Case in point: among the systems in place within Rainbow Moon is a hunger meter. It decreases consistently and does not impact the game until the meter is empty. At this point characters will lose HP. The meter is easy to fill and food is available enough, but the whole meter seems pointless. It’s as if the designers want players to forget the meter exists as a “Gotcha!” prank. At some point monsters start fusing together to form a creature twice as powerful. Literally – around twice as many turns, twice the damage, twice the HP and so on. At the end of the main story, and even in the last few battles just about every creature does this. It just happens at some point to make a rather awkwardly challenging game randomly more awkward and harder. Even players who have kept up with the grind may have trouble with the regular forms let alone the fusion-danced varieties. Thankfully, dying just means players start in front of their murderer with one HP to Baldren and no one else. Death is cheap in Rainbow Moon both ways. The game is filled with these moments. Yes, it makes the game harder, but things like fused creatures and awkward stats crop up a majority of the time. Strategy goes out the window, and the game falls into a pattern of fighting one party of creatures, spend money to heal, and repeat forever. Any strategy without a nearby healer becomes less tactics and more inventory management. These extremes make Rainbow Moon not a treadmill, but a mountain climb. In bare feet. Both in-game and on the main menu players are able to spend real cash to get Rainbow Pearls and Coins. My initial PS3 copy came with a little of both as a promotional item. Once the cross-save was played on the PS3 and saved, these items showed up ready for use on my Vita copy. Whether or not a player wants to spend more money to save some time is up to them, but I’m never happy to see these shops in-game. An absolute ton of stuff to do. This game will keep interested players busy for over 100 hours easy. Graphics and sound are very good. The battle system is not enough to carry Rainbow Moon, and the plot might as well be non-existent. The game seems woefully random for a strategic-based system.